Very special thanks must go to Gerhard Püttbach and Gert Schreiber for help with this page. 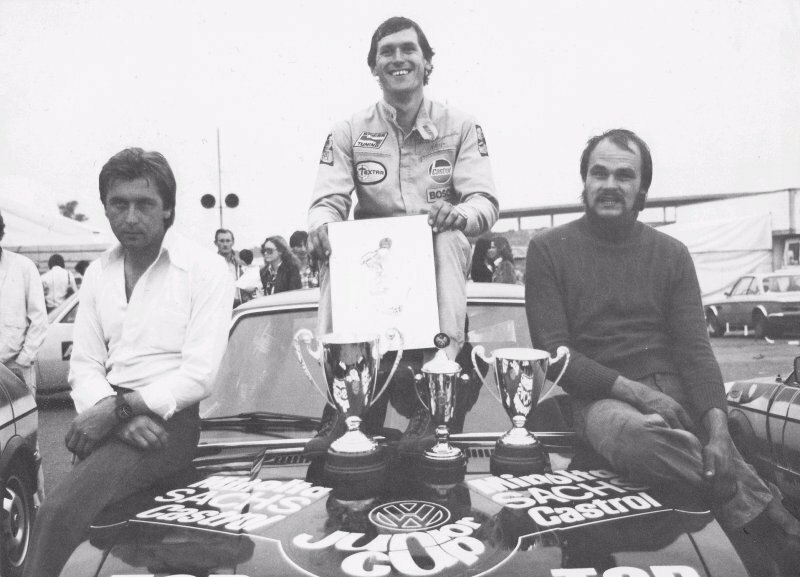 They were drivers in the 1976 JuniorCup. Following on from the Formula V racing series, Volkswagen introduced the one-make Junior Cup series for the 1976 season. In its inaugural year of running, 50 specially commissioned Sciroccos were raced using the new for ’76 fuel injected engine. The premise of the new race series was to give young, promising racers the opportunity to prove themselves in a relatively cheap race series that was on a level playing field due to the identical cars. 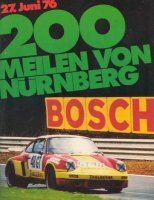 Prospective racers, all of whom had to be under the age of 30, needed to apply to Formel V Europa (now VW Motorsport) in Hannover for a chance to buy one of the 50 Sciroccos. Around 1200 initial applicants were whittled down to 200 due to the 5000DM deposit required. 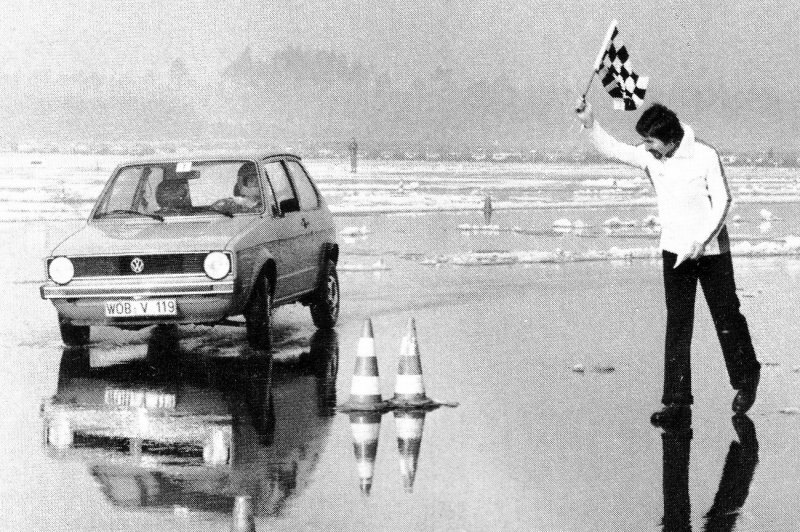 Due to the overwhelming number of applicants, a test session was held at Volkswagens Ehra-Lessien test track on February 22nd 1976. Slaloms, wet track, time trials and cornering tests ensured that only 45 drivers with the best abilities were given the chance to race in the Junior Cup. The remaining seats were given to winners of other race series. Professional guest drivers, celebrities and journalists would race in some rounds, starting at the back of the grid. The main sponsors of the series were Castrol, Sachs and Minolta. Wolfgang Schütz (wearing sunglasses) checks out the demonstrator Cup Scirocco at the Ehra-Lessien test. A hopeful Junior Cup candidate at the Ehra-Lessien test day. A VW publicity photo for the Junior Cup. “The profile in-depth of the tyres was controlled , some very clever participants had rubbed/polished the tyres to the minimum. They all could buy new ones from Pirelli and had to start with these new tyres that had never seen any training mileage”. Instead of the drivers keeping the same race number for each round, the number displayed on the car indicated their position in the championship table at that time. 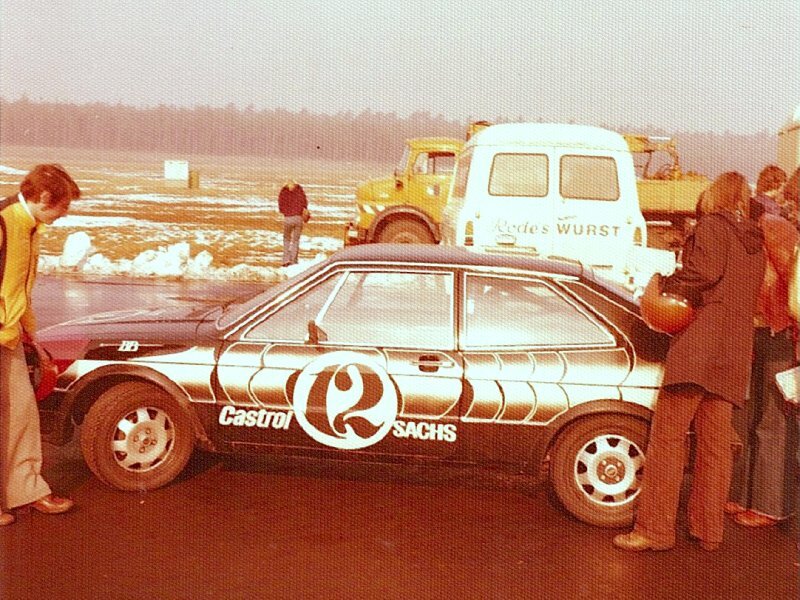 For example, Luis Bachmaier was car No.2 at Mainz Finthen. He won that race and became the championship leader. Hence in the next race at Hockenheim, his car was No.1. The number of points awarded for finishing the race from 1st to last place varied from race to race depending on the number of entrants. For example, if a race had 40 entrants, 40 points were awarded to the winner. Each following place was awarded 1 point less, 2nd 39, 3rd 38, 4th 37, 5th 36 etc. Round 1 of the series took place on 11th April 1976 at Hockenheim, as a Formula 2 ‘Jim Clark Rennen’support race. Seven more races took place at tracks like Sylt and the Nürburgring, with the season finale returning to Hockenheim in September. 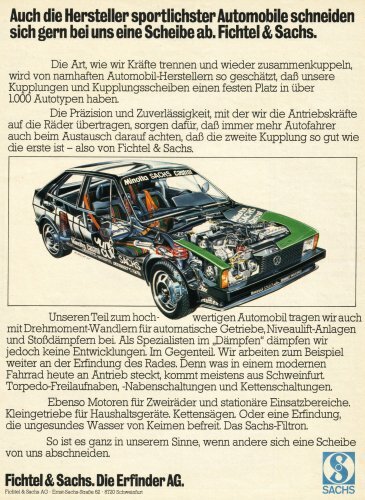 The outcome of the season was a point of contention in German car magazines of the era. The series win was awarded to Willi Bergmeister by series organizers Formel V Europa for amassing the most points over the course of the season. ‘Sport Auto’ magazine claimed that Manfred Winkelhock should have won the title due to him winning the last race at Hockenheim as stated in the series regulations. L-R. Luis Bachmaier 3rd, Willi Bergmeister 1st and Wolfgang Schütz 2nd in the championship. Manfred Winkelhock. Later in his career he would race in Formula 1. Tragically, he was killed in 1985 whilst participating in an endurance race in Canada. Click on the Round 1-8 buttons to go to each race page. Click on the programme thumbnails for entry lists. MUSIC-GEORGE LYNCH, LOVE POWER FROM THE MAMA HEAD. ALBUM, SACRED GROOVE. Sport Auto magazine and Alpina gave readers a chance to vote on which driver they considered to be the best at drifting the car during races. An odd thing to do for front wheel drive cars. 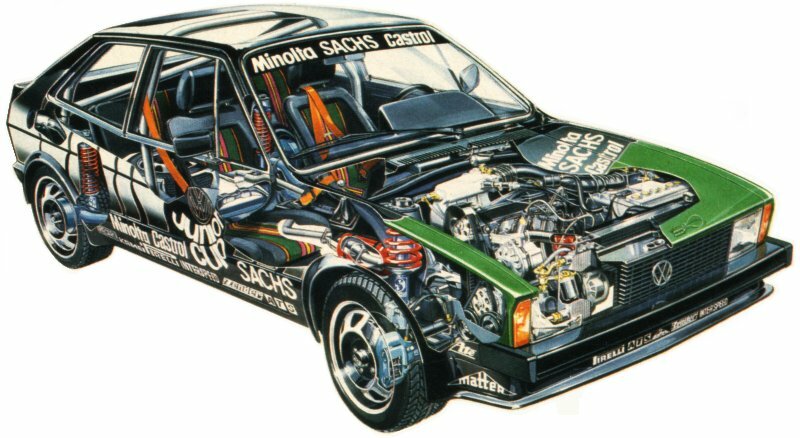 Cutaway pic of a Scirocco Cup car. Click on the image for XL version. 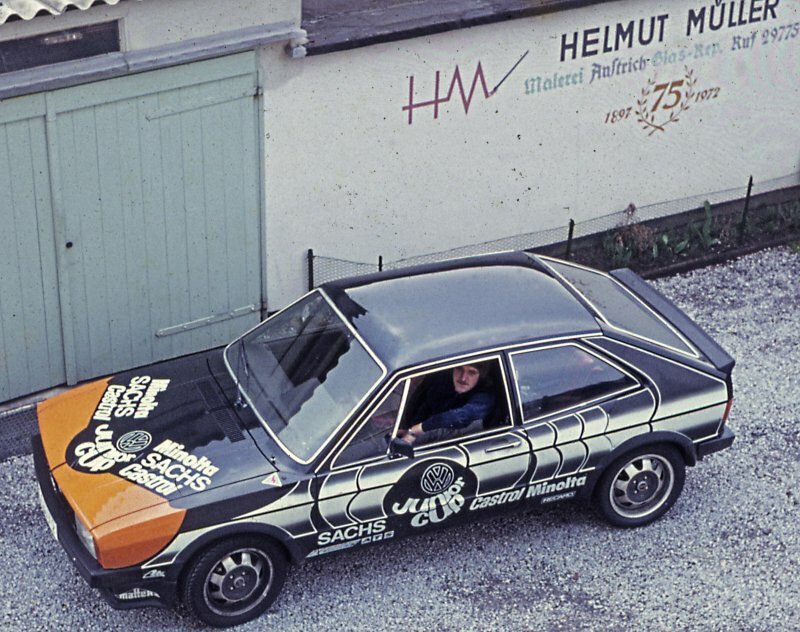 The Cup Scirocco could be used as an everyday road car, as Gerhard Püttbach demonstrates. 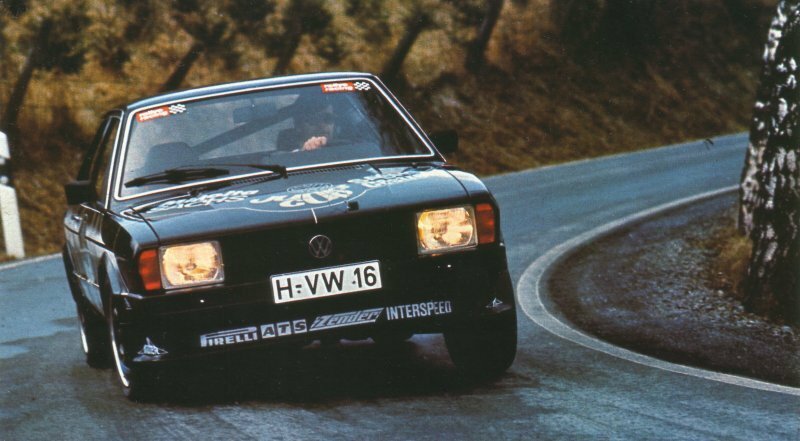 Although the Cup Scirocco cost 22,000DM to produce, it was sold to participants in the series for only 15,500DM, which for a race spec car compared well to the 13,000DM for an off the shelf Scirocco TS. The new 1.6 litre engine used Bosch K-Jetronic fuel injection, producing 110bhp. 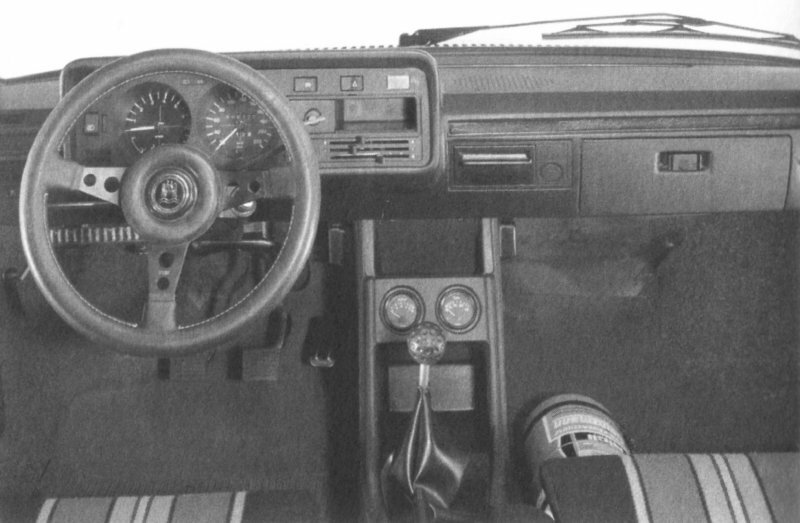 A precursor to the Scirocco GTI that was available from VW dealers later in 1976. To control oil temperature, a Serck oil-cooler was provided. For race use, the road legal rear exhaust box was removed and replaced with a through pipe. Suspension was upgraded to included lowered, stiffer springs with Sachs gas shock absorbers. 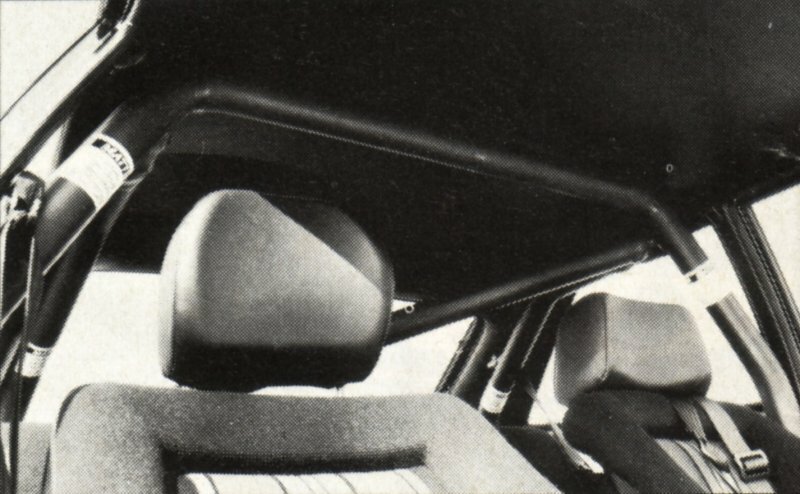 A 24mm anti-roll bar was attached to the rear beam. This gave neutral handling that promoted drifting when cornering at racing speeds. To assist traction and further improve handling, Pirelli 195/50 15 tyres were mounted on 15″ ATS Cup alloy wheels. ATE vented brakes discs up front combined with rear drum brakes help to retard forward motion. 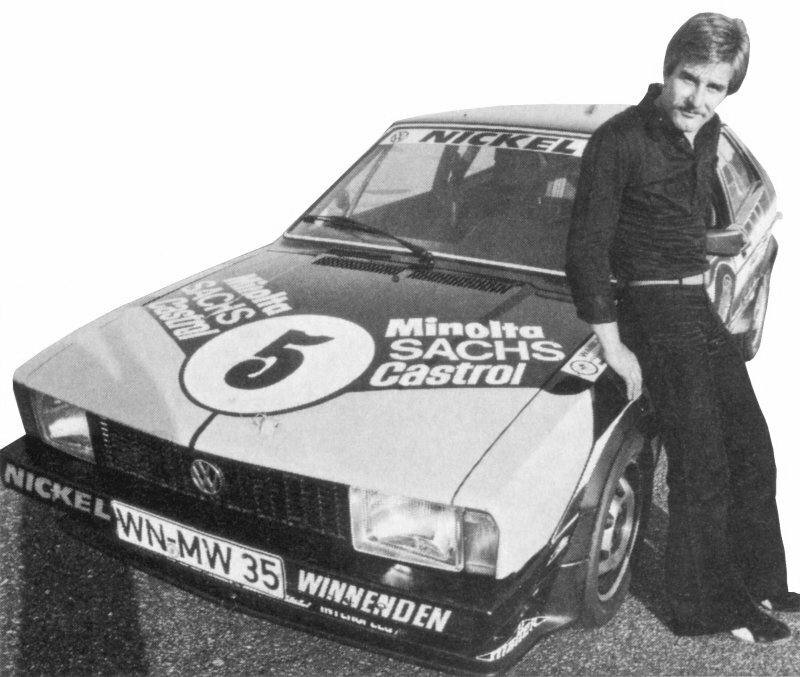 This early pre-season press car had differing sponsors graphics than the race Scirocco. 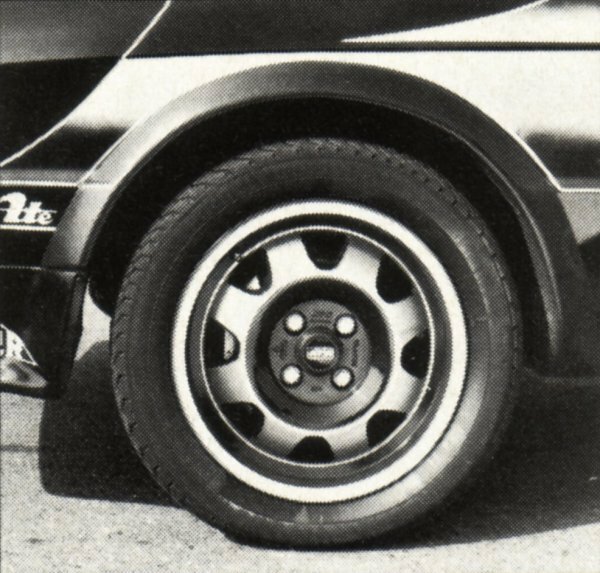 Externally, the Scirocco Cup gained a Zender body kit comprising front and rear spoilers with wheel arch extensions. All cars in the series were black with the same graphics and sponsor logos. To differentiate the cars, the nose was painted in various colours. 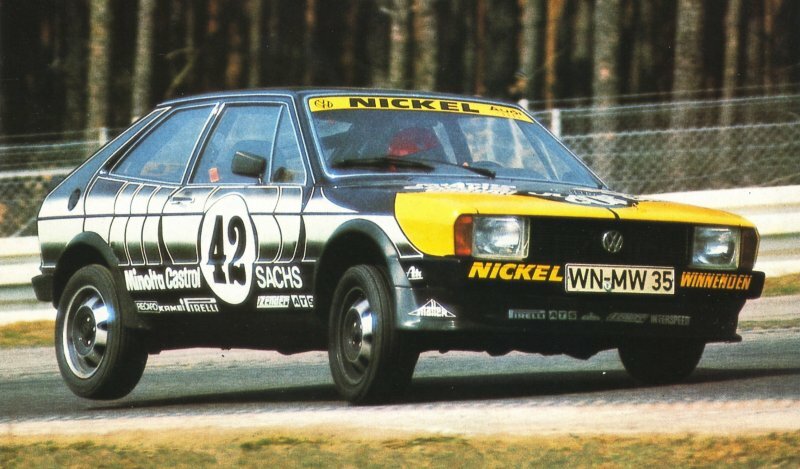 Judging by the ‘T.V.’ headlights and black bumpers, a basic model from the Scirocco range was used as the basis of the Cup racecar package. 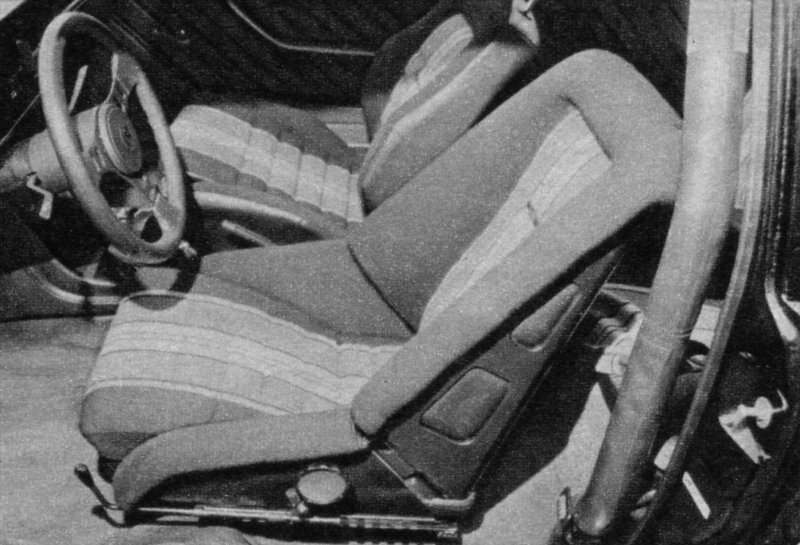 In the cockpit, a Matter roll cage and Britax harnesses ensured driver safety. 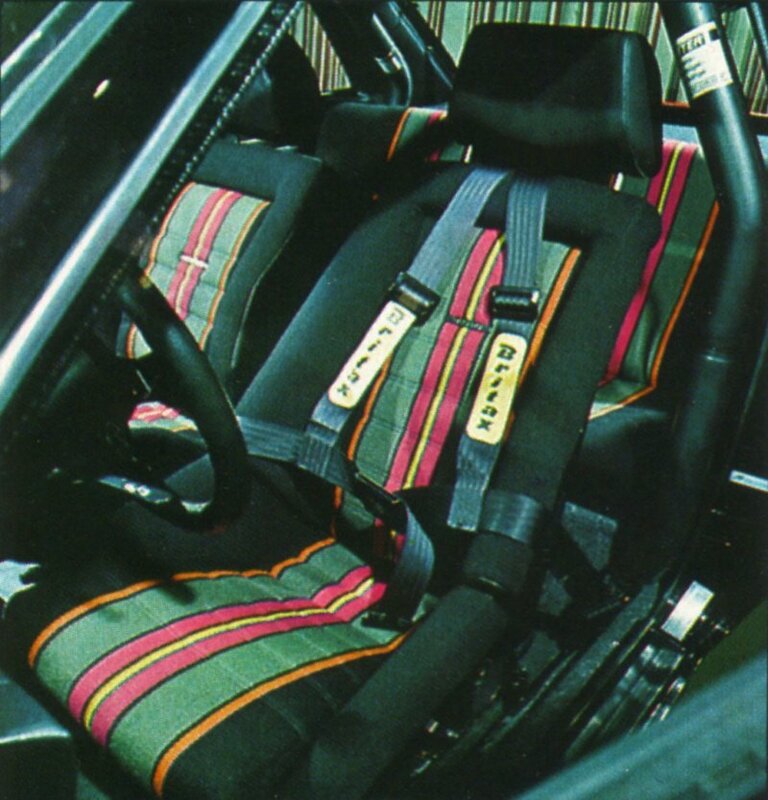 Recaro front seats were fitted, the drivers being a racing bucket type. The colourful striped trim continued on the rear bench seat. 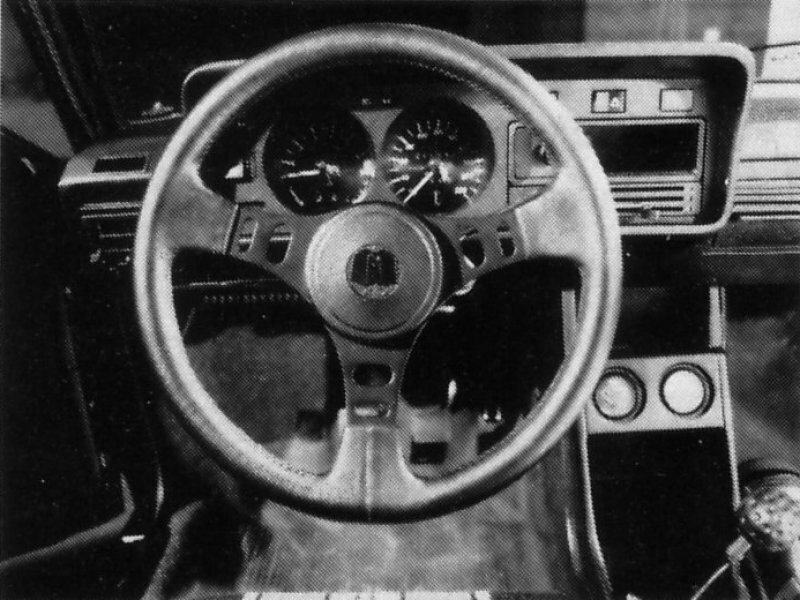 Steering was through an Interspeed Victor sports wheel. Further safety features included a Heinzmann fire extinguisher and an electrics cut off switch. Scirocco Cup versus Scirocco GTI. 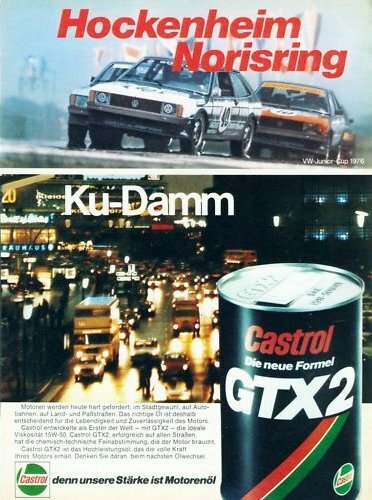 Series sponsors Castrol and Sachs featured the Junior Cup in advertising campaigns. 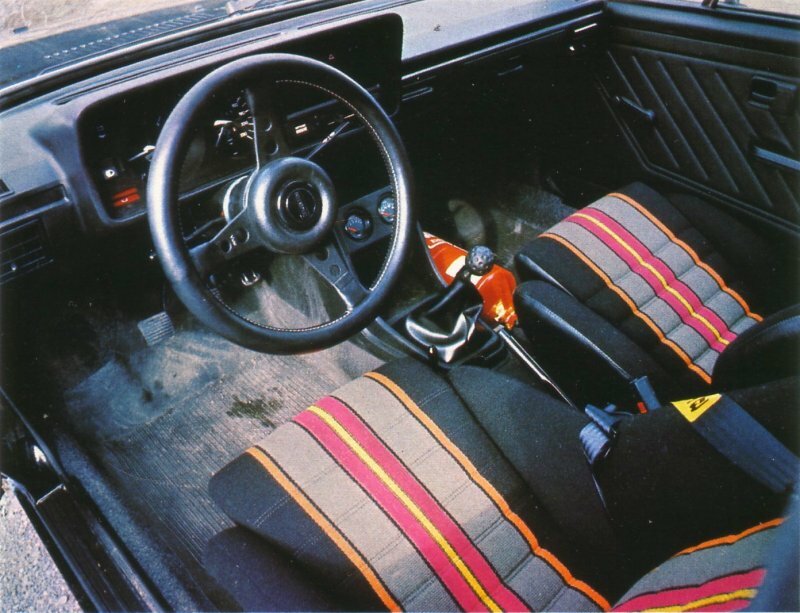 In 1977, the Scirocco was replaced by the Golf GTI in the VW Junior Cup. Over the years the VW one-make format has also featured the Polo, New Beetle and Lupo. 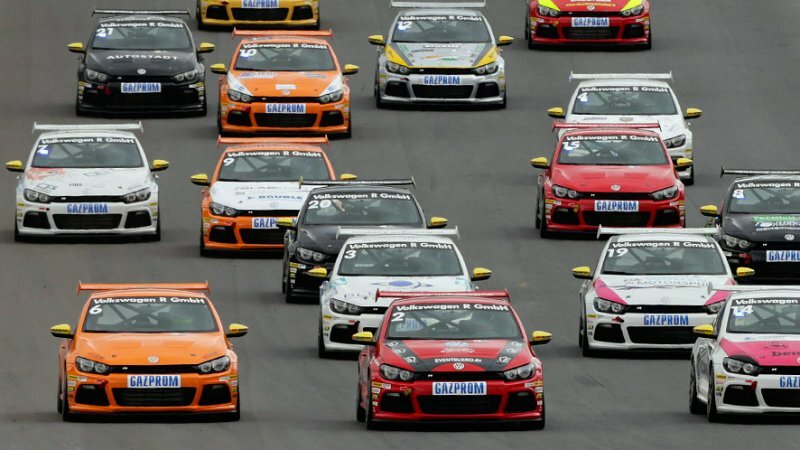 2010 saw the return of the Scirocco in the Scirocco R-Cup series which ran until 2014. 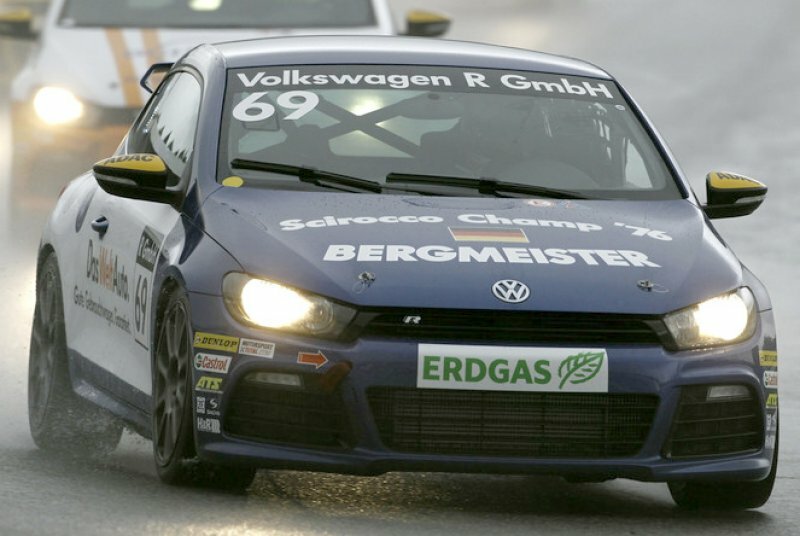 For more information, please click on the logo to go to the official VW Scirocco R-Cup site. 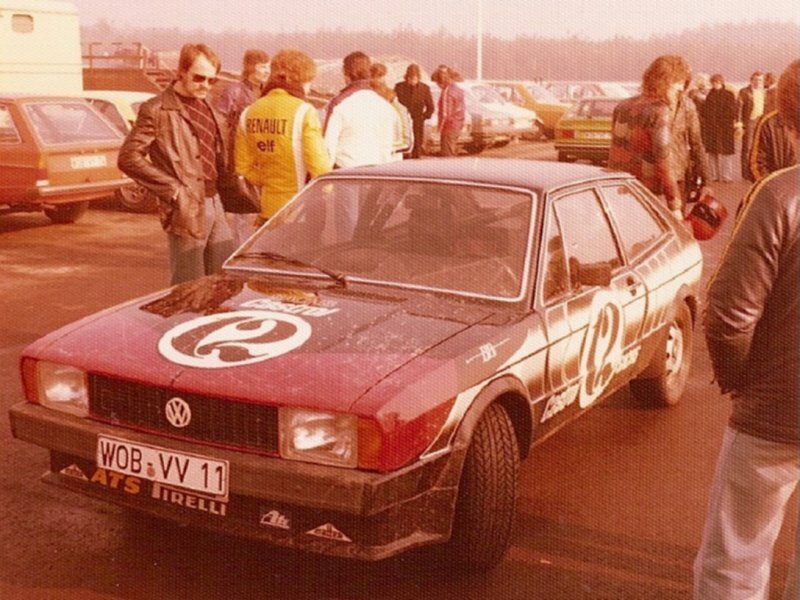 1976 VW Junior Cup champion Willi Bergmeister took part in the final race of the 2010 Scirocco R-Cup season. The championship was won by Kris Heidorn. Hockenheim. Mateusz Lisowski (8) took the series title. Ola Nilsson (23) wins the 2012 season opener at Hockenheim and goes on to win the championship. 2012 Volkswagen Scirocco R-Cup Calendar. *Race won by Markus Winlekhock, the son of Manfred. 2013 Volkswagen Scirocco R-Cup Calendar. 2014 title winner Jordan Lee Pepper(17) on his way to a double win at the Hockenheim season opener. 2014 Volkswagen Scirocco R-Cup Calendar. 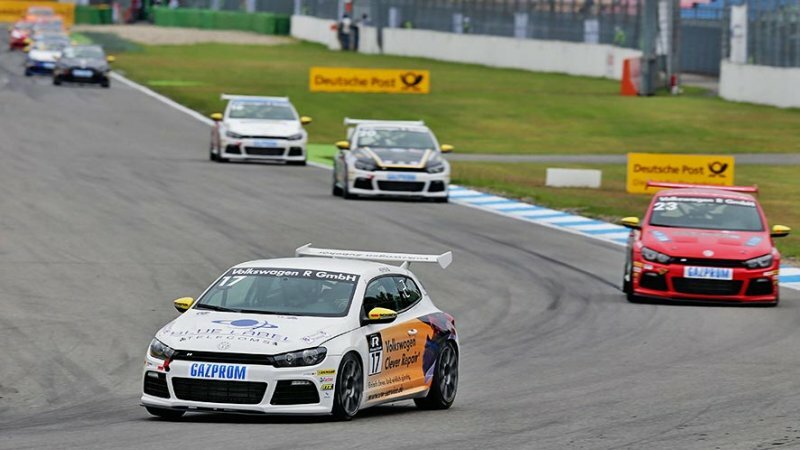 *Mikaela Åhlin-Kottulinsky became the first woman to win a race in the Scirocco R-Cup.